A metal sill integrates with the bottom mullion. My complements to the European high-performance window manufacturers for providing built-in sills for their windows. I hope that North American high-performance window manufacturers soon provide built-in sills. The built-in sills, along with block-frame window installation, sure simplify installing high-performance windows in superinsulated walls. 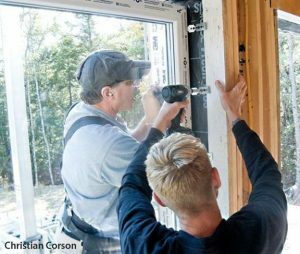 American builders have tried dozens of different procedures to install nail-fin windows in superinsulated walls, experimenting with complex strategies to integrate a continuous air barrier, water-resistive barrier (WRB), and foam sheathing into the window installation. 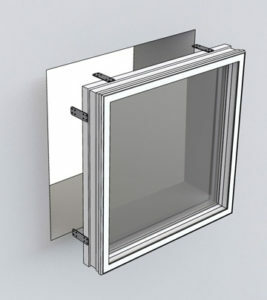 Block-frame window installation is easier and more flexible than nail-fin installation. None of the nail-fin window installation methods I’ve seen are very elegant or effective at creating a fail-safe window assembly in superinsulated walls. Those plastic and metal sill pans along with the flashing tape with doubtful sticking power don’t inspire much confidence either. Exterior foam insulation really complicates the process of attaching the window to the rough opening. I hate the idea of driving long fasteners going through the fin and the foam before finally penetrating the framing. Do we really want foam to carry any of the window’s weight? The window sill is always the most vulnerable area to moisture damage. 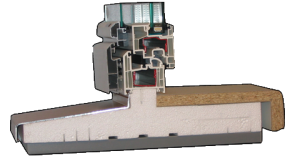 The combination of a spread-on WRB sealant around the window rough opening and the integrated sill create the most watertight high-performance window installation for superinsulated wall. You still have to flash the side jams and head jamb, but a metal sill, integrated with the bottom window mullion, removes most of the risk of sill water damage if you’re careful to seal the corners of the rough opening. The built-in sill guarantees that the water falling on the window exterior drips free from the wall assembly. Fastening clips anchor the window to the rough opening in a block-frame window installation. Block-frame installation facilitates installing triple pane windows from indoors rather than the more difficult outdoor-installation option. Mounting a big triple pane window from the outdoors is a real challenge. Block-frame installation also avoids the folly of fastening through a nail-fin window into exterior foam, or God forbid, resting the window’d weight on the foam. Great article by srmi.biz on high efficient windows. High efficient windows with high efficient thermal blinds make the perfect combination to save energy at home. It’s interesting to see how window installations work. It makes sense that there would be a lot of different types depending on the kind of window! Maybe it would be a good idea for me to rely on a professional to install mine. That way I don’t have to worry about doing it incorrectly.